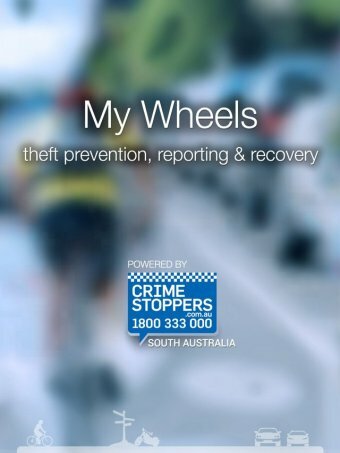 A mobile phone app developed by Crime Stoppers, which allows users to report car and bike thefts and suspicious activity, may soon be rolled out across Australia. The innovative technology is being trialled in South Australia in response to the high rate of vehicle thefts throughout the country. My Wheels was launched in November and currently has more than 5,000 users. It allows users to report thefts and serious vandalism and users can earn “good Samaritan” points by reporting suspicious activity. It also stores insurance and vehicle details including photos. The app uses GPS to remind a user where they parked and to alert them if a vehicle theft or vandalism has just occurred in the near vicinity. Crime Stoppers SA chair Sharon Hanlon said a wide range of experts were consulted about the app. During consultation Ms Hanlon said Crime Stoppers found there was a demand for the app to also accommodate bicycles and motorcycles owners. “These days more and more people are spending a lot of money on their bicycles and indeed bicycles are one of the hardest things to find their owner and then return it to them,” she said. That’s one of the exciting developments that we’re looking forward to introducing down the track, something that would just be a press of a button and it virtually it would be an online reporting function. Ms Hanlon said the app was about prevention of theft in the first instance, but also looked to assist users if their vehicle was stolen. “The other element is that if the worst should happen it’s about reporting that, either straight to the police, to the insurer or indeed users can use social media so if they wish, to post immediately through their Facebook or Twitter accounts – all that information is at their fingertips,” Ms Hanlon said. “They’ve already taken photos of it and it’s instantaneous and it’s about the community then getting behind the app and looking for those vehicles. Currently users are given telephone numbers to call and the app prompts them with all the relevant information to report the theft or vandalism. But it is hoped the technology will soon be developed to allow that information to be reported automatically. “That’s one of the exciting developments that we’re looking forward to introducing down the track, something that would just be a press of a button and it virtually it would be an online reporting function,” Ms Hanlon said. The app will be rolled out across the country once it builds momentum. Ms Hanlon said on average about two thefts are reported through the app every month, about six reports of serious vandalism are being made every month and up to 10 reports of suspicious activity are being reported. “So people are actually observing something, they think that it looks a bit suspicious that somebody is hanging around a vehicle that they’re perhaps walking away, coming back, seeing if anyone else is the area. So very high volumes of suspicious activity,” she said. About 60,000 cars are reported stolen. Only about a third are recovered. About 9,000 motorbikes are stolen. Only about a third are recovered. More than 200,000 bicycles are stolen. Less than five per cent are recovered. Bike SA CEO, Christian Haag, said the app would help bicycle riders share information and act quickly if a bike is stolen. “It does cost the community significantly. It costs South Australian police many hours of work to try and retrieve these stolen bicycles, but I think with the assistance of apps like this then it does streamline and facilitate the return of those bikes,” Mr Haag said. “I think we’re seeing now, particularly with social media, that the cycling community is a very close community and very quickly word spreads and cyclists are very supportive to help each other retrieve those bikes, so we’re seeing examples where what used to be a miracle is almost a common occurrence.